There can be a nice flow of ideas today, and useful connections can be made. 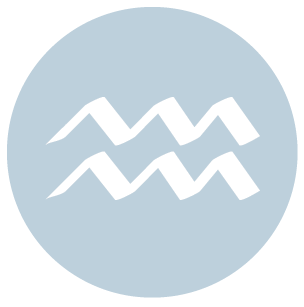 Later today, retrograde Mercury and Neptune close in on a square, pointing to some confusion or misreading of signals. 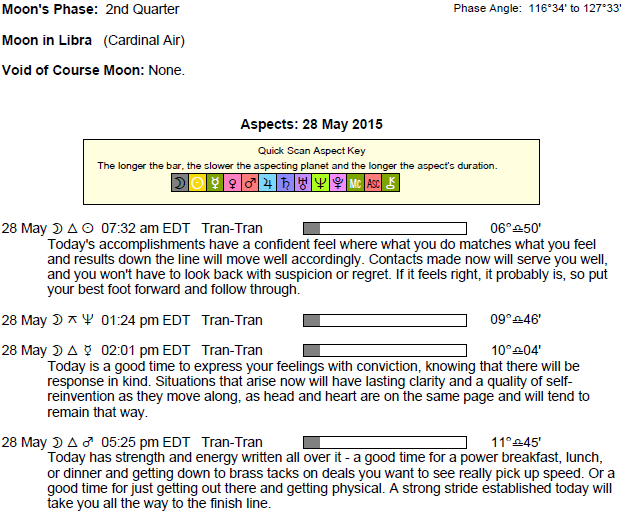 The Moon is in Libra all day (until Saturday, May 30th, at 5:33 AM). 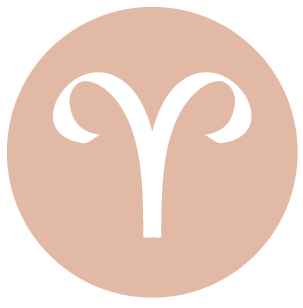 There should be nice energy with you today for conversations, learning, communicating, and studying, Aries. There is a bigger focus on others, your relationships, and negotiating or accommodating people in your life, and quite a bit of pleasure in so doing, as you tend to want to spend time in others’ company. Later today, you can be a little more sensitive to imbalances in your environment, including situations that are too messy and hectic, and to what others are saying. There may be some second-guessing of plans, as small weaknesses seem to reveal themselves. A conversation or news received now can be misleading. Let time tell. 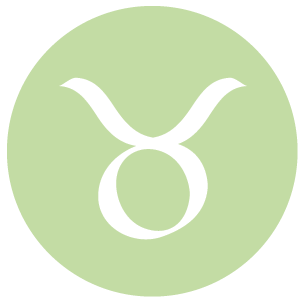 This can be an easy day for work-related matters, dear Taurus, as you seem to naturally fall into a productive rhythm and have a nice feeling of being in synch with the people around you. This is a good week for looking at your finances and work or security matters in a new or different light, and coming up with solutions. However, there may be a bit of confusion in these areas to get past first. Later today is not the best time for clarity, particularly when it comes to finances, but also personal boundaries, possibly with a friend. There might even be some sneaky behavior going on around you. Whether it’s about bluffing or withholding information, it’s best to postpone big decisions or complicated topics. 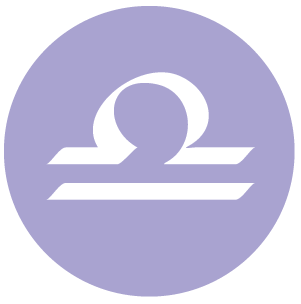 Much of the day, you can feel quite supported and rather free, dear Gemini, so that letting loose your more expressive, playful, or creative side is natural and easy. There is a sense that you can get pretty much anything done. Your head and your heart are working in harmony now, and this means you can make connections you wouldn’t normally make. Later today, your imagination can grow, possibly to a point of excess, with your ruler, Mercury, challenged by illusive Neptune. It’s important to avoid making too much or too little of a person or situation under this influence. Use this time for imagining possibilities without jumping to conclusions. Let time tell the truth of a matter. 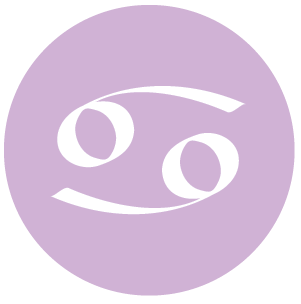 Your need for security and comfort is more pronounced today, dear Cancer, and you’re likely to seek out either the company of familiar people or privacy and solitude today, as you’re in need of a bit of a retreat or respite. It can be a wonderful time for emotional renewal, as well as moments spent with important memories. Look within and to your support system for what you need today. Not all communications are likely to get through exactly as intended later today, but if you let go of expectations and simply allow your mind some free rein, it’s a good night for creative visualization and pursuits. 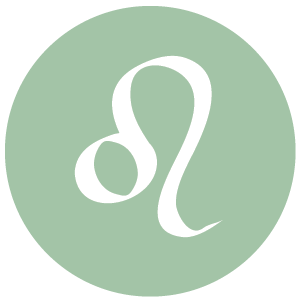 You can be feeling especially eager and confident today, dear Leo, particularly when it comes to communications projects, learning, studies, friendships, and team work. There can be a good feeling of emotional rapport with others, as well as enthusiasm for future projects and activities. As the day winds down, emotions and imagination tend to strongly color your perceptions. This week is strong for generating ideas that can significantly impact your life, particularly related to long-term happiness goals, group associations, and friendships. First, you may need to rethink a few details, and tonight, there can be a confusing attachment or a crossing of boundaries that is hard to interpret. 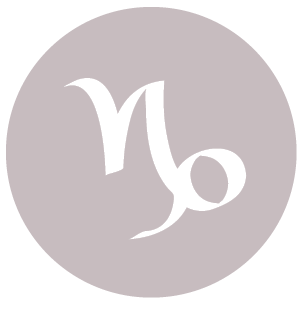 Emotionally, you’re more sure-footed today, dear Virgo, with the Moon now out of your sign. Focus is on what can be done, as well as activities that build and support rather than satisfy in the moment. Much of the day seems supportive of your efforts to make a mark on practical levels, and you feel rather enthusiastic about recent projects and ideas. As the day winds down, let your mind go and entertain more out of this world ideas and thoughts, as your ruler, Mercury, is coming to a hard angle with Neptune, reminding you to soften some of the hard edges of your mind and to entertain less obvious possibilities. With this influence, avoid solid commitments, as it’s not the time for clarity. The Moon is in your sign all day, Libra, and is communicating well with planets transiting your adventure sector. This stimulates a pleasant, fresh outlook and sense of general support, airy lightness, and positivity. You are a little braver than usual, particularly for entertaining new concepts and ideas, for expressing your feelings or opinions, and for believing in someone or something. You can more fully appreciate the cooperative elements of your life. Personal enjoyment should be easy, but later today it’s vital that you avoid expecting things to transpire exactly as expected, and to avoid taking things at face value only, as there is a rather dreamy but confusing and possibly disorienting aspect between Mercury and Neptune active later today and early tomorrow. Watch for forgetfulness. 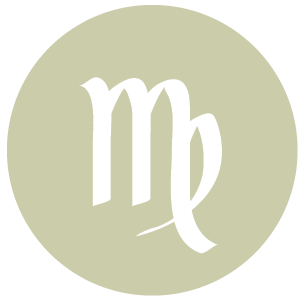 This can be a great day for looking back on recent events and discovering different ways to approach areas of your life that have grown a little dull, dear Scorpio. Today and this week are strong for coming up with ideas that can have significance in your future, particularly related to self-improvement programs, your intimate life, and financial support or shared resources. To get there, however, you may need to deal with a bit of confusion in these areas. Imagination is powerful later today, possibly to the point of self-deception, but if harnessed and channeled in the right direction, you can be highly creative right now. Much of the day is good for spending with a partner or friends, Sagittarius. Sharing ideas, enjoying activities with others, networking, and negotiating can be in focus now, and quite favored. It’s only towards the end of the day that there can be some lack of clarity. It’s a good time for dreaming up new ideas, but less ideal for discovering concrete answers or commitments. The best way to handle this energy is to resolve to let go of expectations and simply enjoy the moment. A partner could be giving off mixed signals. Look for new ways to approach the people in your life if you feel a little distant. With Mercury retrograde, this is a strong time for rethinking problem areas, particularly relationship-related. 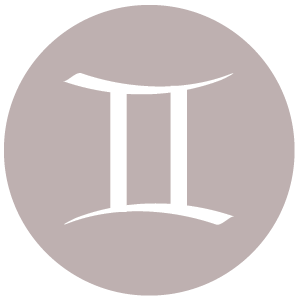 Most of the day is strong for exchanging ideas, making plans and lists, devising strategies, and considering different sides to a problem, Capricorn. You may be anxious to share some of your recent ideas and enthusiasm with others, or to build upon them on your own. 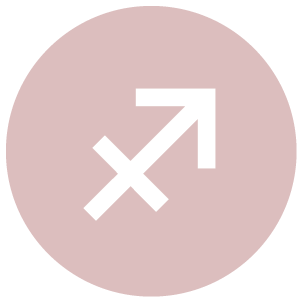 Later today, as Mercury and Neptune move towards a square, engage your creative and imaginative side rather than focus too heavily on facts and figures. Sometimes when these two planets meet, we can get carried away with impractical ideas, but if you stay grounded and simply entertain possibilities, this shouldn’t be a problem. You get nice support from a group of planets in fellow Air signs today, dear Aquarius, and this gives you a feeling of general ease and lightness. You can in fact feel quite buoyant now. Certainly, your more creative and playful sides are easier to access and express. You can be excited about recent new ideas and might be playing around with how you might turn them into something solid. Towards the end of the day, clarity isn’t as easy to come by. Mercury and Neptune are moving towards a square, and this tends to cast a temporary layer of fog over your thinking. Use this energy to entertain fantasies, but wait before making big decisions, particularly related to matters of the heart and financial affairs. 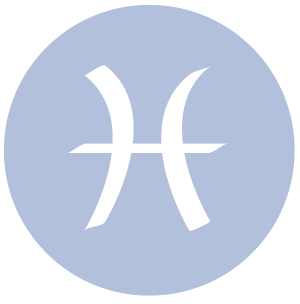 This can be a good day for keeping your mind and body busy, Pisces, even with a rather retiring quality to your nature right now. You could be very busy with your memories, and with reviewing recent events and conversations. Keep a healthy flow of communication going with family and those close to you. 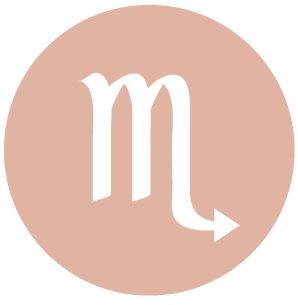 Consider ways to improve the ways you communicate, as this is a strong period with Mercury retrograde to look at the ways you connect with others in new ways. This week is strong for seeing where improvements can be made. Later today, there can be some confusion or lack of clarity that crops up with family or concerning domestic affairs, however. It’s a chance to look for inconsistencies in plans. You are assertive and able to motivate yourself because you have self-confidence. You have the ability to recognise opportunities and make the most of them. You can rise to a challenge. You tend to be a martyr. You need to learn to say no and indulge yourself. 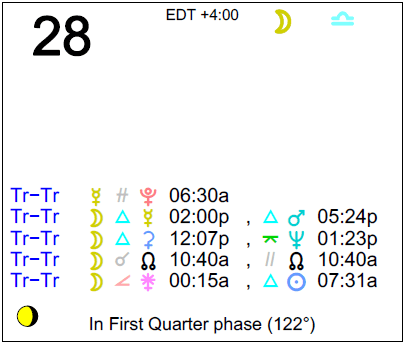 Sun 03° Taurus 03' 10"
Moon 24° Sagittarius 15' 49"
Mercury 08° Aries 17' 38"
Venus 03° Aries 25' 26"
Mars 15° Gemini 17' 32"